Diamonds are the most popular stones for engagement rings for a number of reasons. First of all, they are beautiful. Cut properly, no other gemstone can match the fire and sparkle of a diamond. Diamonds are also extremely durable, being the hardest, naturally occurring substances known to man. In recent years, the demand for diamonds has skyrocketed, sending prices higher and higher. Diamonds will never lose their value and are timeless pieces of jewelry that can be passed from generation to generation. Diamonds are made of pure carbon deep within the earth under tremendous heat and pressure. Over millions of years, carbon deposits are squeezed until the molecular configuration of the crystal changes, creating a diamond. When purchasing diamonds, jewelers and gemologist evaluate and price the stones based on the “four C’s”. “The four C’s are characteristics — carats, clarity, color, and cut — that help to define the quality of a diamond. When purchasing diamonds for an engagement ring, it’s important to buy a stone that is the highest quality within budget. Many people are under the impression that carats are the most important factor in determining the value of a diamond, but a larger stone is not necessarily better. Yes, larger stones are more noticeable and have a bigger visual impact, but they may not always be of the same quality as smaller stones. Smaller diamonds that have better color and clarity will always cost more than a large, flawed diamond. These diamonds are the most sought after in all the world and command the highest prices in wholesale markets and in jewelry shops. As the quality of a diamond decreases, so does its price. Diamonds are available in many colors, although fancy colored diamonds are rare and very expensive. Most diamonds range in color from pale yellow to white (colorless). The clarity of the diamond refers to how clear the diamond is. Most diamonds have minor flaws in them that cloud the stone. Also, some diamonds possess a property called fluorescence, which makes them glow under ultraviolet light. Diamonds that have high fluorescence can appear cloudy. Perfect diamonds are classified as grade D and flawless, meaning that they are clear white and have no internal, structural flaws. The last, but often overlooked characteristic that determines the quality and price of a diamond is the cut. Diamonds found in nature hardly resemble cut stones. They are dull and might even be overlooked as being normal stones by people who are uneducated about gemstones. The cut of the diamond is what brings out its fire and beauty. In the hands of a skilled jeweler, the way the stone is cut can turn a lower quality stone into one that looks expensive. The most popular cut for diamonds is the round brilliant cut. Another cut that is quite popular is the emerald cut diamond. As the name suggests, the cutting technique used to fashion emerald cut diamonds came from designs used for creating jewelry from emeralds. Emeralds are notoriously fragile, having many internal flaws that make cutting the stone and crafting fine jewelry difficult. 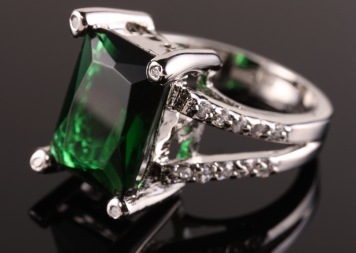 Jewelry makers quickly learned that minimizing the number of cuts to an emerald could bring out the beauty of the stone without the risk of fracturing it. A brilliant cut diamond has as many as 58 facets, each of which must be carefully cut. In contrast, an emerald cut gemstone has 28 facets, almost half of the cuts required to fashion a brilliant cut diamond. Some, more exotic cuts can have as many as 70 facets. Jewelers began to realize that the emerald cut could also be used for other gemstones like diamonds. Diamond engagement rings that have an emerald cut stone are elegant and can be radiantly stunning. For one thing, an emerald cut stone elongates the lines of the diamond, making it appear large. Next, the stone catches light better than a brilliant cut diamond, producing greater flash and sparkle than a brilliant cut diamond. Emerald cut diamonds lack the fire of brilliant cut diamonds, but are still none the less stunning cuts for the precious stone. Choosing a diamond that is suitable for an emerald cut is a demanding process. Because of the low amount of facets, a large amount of the surface area of the diamond will be exposed. This will allow all the flaws in the diamond to be seen. Brilliant cut diamonds can disguise these imperfections, but with emerald cut diamonds, all the flaws are out in the open. For this reason, the highest quality diamonds are often used in emerald cut stones. Normally, high quality stones are very expensive, but color, clarity, and carats are only part of the equation for determining the price of the diamond. The cut is equally important. Luckily for people who are shopping for an emerald cut diamond, this style is much less popular than a brilliant cut diamond, which is demanded nearly 75% of the time by engagement ring shoppers. Because the demand for an emerald cut diamond is much lower than for a brilliant cut, prices tend to be between 20-25% lower for the same grade diamond in terms of carats, clarity, and color. The color of an emerald cut diamond is also important. As more of the surface of the diamond is exposed, the color of the diamond will be more noticeable. Therefore, choosing a diamond with a color grade of less than G will make the diamond appear pale yellow. This should not be confused with fancy yellow colored diamonds, sometimes called canary diamonds. These diamonds are so vividly yellow, that they transcend the white/yellow diamond grading scale and are classified as fancy colored diamonds. Next, the clarity of an emerald cut diamond is critical. The clarity of a diamond is influenced by the number of imperfections within the diamond that are called inclusions. These can make the stone look cloudy and muddy. An emerald cut stone will magnify imperfections and be very noticeable even to the untrained, naked eye. Clarity is graded on a 9-tier scale ranging from internally flawless to heavily included. Emerald cut diamonds should have a clarity of at least VS2, meaning that the diamond has very few inclusions. Finally, it’s important to make sure that the proportion of the cut looks good. Most jewelers will cut the stone to have a length to width ratio between 1.5 to 1.75:1. Another aspect to consider is the table size and the depth of the stone. The table size refers to the size of the top facet, expressed as a percentage of the total surface area of the diamond. The table size should be between 58% and 69%. If the table size is too large, the diamond can look glassy and fake. The depth refers to the height of the diamond in its setting. The depth should be in the same range as the table size. A depth that is too great will make a stone look smaller than it is. Why Buy and Emerald Cut Diamond? Round, brilliant cut diamonds account for 75% of the stones on the market today due to their popularity. Why then would a woman want an engagement ring that has an emerald cut stone? For one, the emerald cut is very sophisticated. For women with long and slender fingers, an elongated, rectangular stone can accentuate the length of her hands. Emerald cut diamonds are particularly well suited for women who like understated jewelry. Emerald cut diamonds do not have the same fire or flash as brilliant cut stones because of the smaller number of facets. Because of this, they can appear simple, yet still stylish. For women who prefer a larger stone, emerald cuts can make the diamond appear larger than it is because of the large table size. Also, with the prices being significantly lower than equal quality brilliant cut stones, the purchaser can afford to buy a larger stone. Another reason that women like emerald cut diamonds is that he diamonds used in emerald cuts are often of higher quality than brilliant cut stones, since the cut demands that high quality stones be used since the cut magnifies flaws in clarity and color. Finally, a good reason for choosing an emerald cut diamond is that they are somewhat unpopular when compared to brilliant cut diamonds. For the woman who likes to stand out in a crowd and who likes to go against popular trends, emerald cut diamonds are a good option. Emerald cut diamonds are not common cuts for engagement rings and can therefore usually be bought loose, without a setting. This allows buyers greater freedom to customize the ring. Diamonds look great in platinum, white gold, or palladium settings as the whiteness of the metals amplify the crystal clarity of the diamond. The stones can be set as solitaires, but they can look equally stunning in multiple stone configurations. Centered between two smaller diamonds or other gemstones like rubies or sapphires, an emerald cut diamond can be the showpiece of a beautiful engagement ring. A slight variation on the emerald cut diamond is called an Asscher cut. Rather than being rectangular, the Asscher cut diamond is squarer. For the woman who likes to buck the trend and who wants a stunning diamond, the emerald cut diamond is the perfect choice. Emerald cut diamonds offer great value for their costs since they are less popular than brilliant cut diamonds. As always, shopping for diamonds of any kind should be carried out in reputable jewelry shops that should be able to provide certification paperwork that documents the quality and grade of any diamond.